When houses in my neighborhood were built (circa 1958) the geniuses decided to place the gas meters near the center of the backyards, right around where third base would be. To top that, some former owner of my house built a brick fireplace right in front of it. Gas and fire, what an interesting combination. By the time I moved in that fireplace was in sad shape, so brick by brick I took it apart, broke up the steel-reinforced concrete pad it was sitting on, and hauled all 3,000 pounds of it to the local dump. 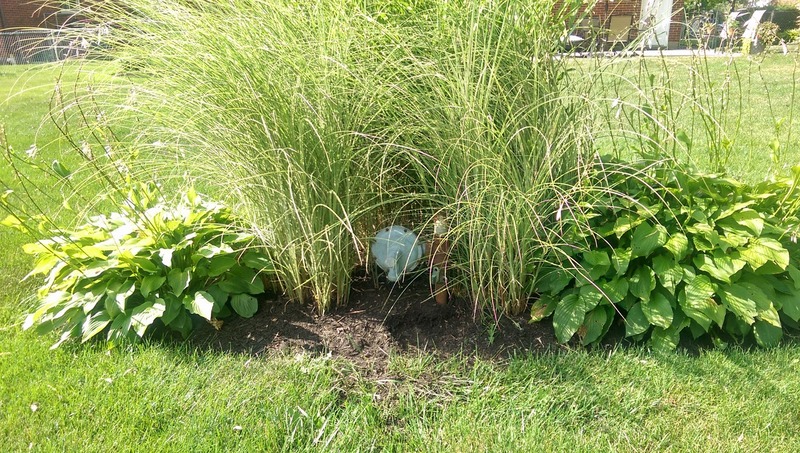 I then moved some sod around to make it horizontal to the house and planted grasses and hostas. What was an eyesore is now a thing of beauty and it hides the gas meter quite nicely.